Plant a pole bean seed – it’s a classic elementary school science experiment. What kid has not watched in amazement as their bean seed sprouts and then quickly reaches to the sky? Karen Ray, School Garden Program Manager at the Thurston County Food Bank, is taking the project many, many steps further. In 18 schools across four Thurston County school districts, the Food Bank is supporting the creation and maintenance of school gardens – allowing kids to plant, weed, and harvest fresh produce. 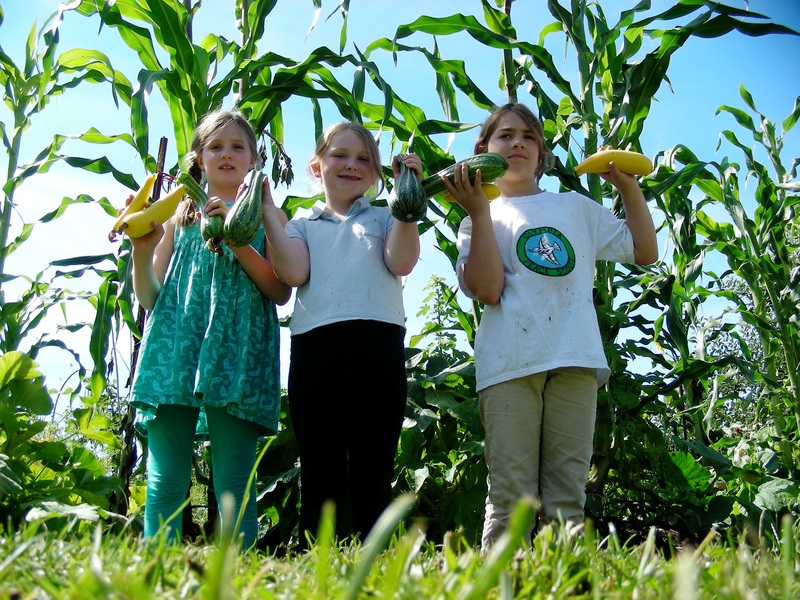 The Food Bank’s goal is to support school gardens so they can continue to thrive. “Often a school garden is started by one or two champions. If they get burnt out or their children age out of the school, the space turns into a weed patch,” explains Ray. The program, now in its third year, was originally started as a unique, preventative way to bring fresh produce to school children. 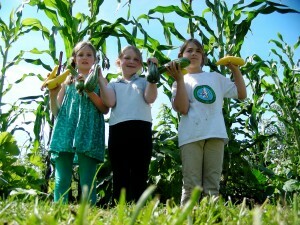 “It’s teaching kids to grow their own food and how fresh fruits and vegetables can keep their bodies healthy,” adds Ray. “Allowing children to plant a vegetable seed, tend it, watch it grow, and eventually taste it is a hands-on learning opportunity that can bring science, math, social studies, language and arts to life,” says Paula Moll, a member of the Office of Superintendent of Public Instruction’s Child Nutrition team. “I think there is no end to the things kids can learn from a school garden – biology, nutrition, stewardship, teamwork, and community service, to name a few. 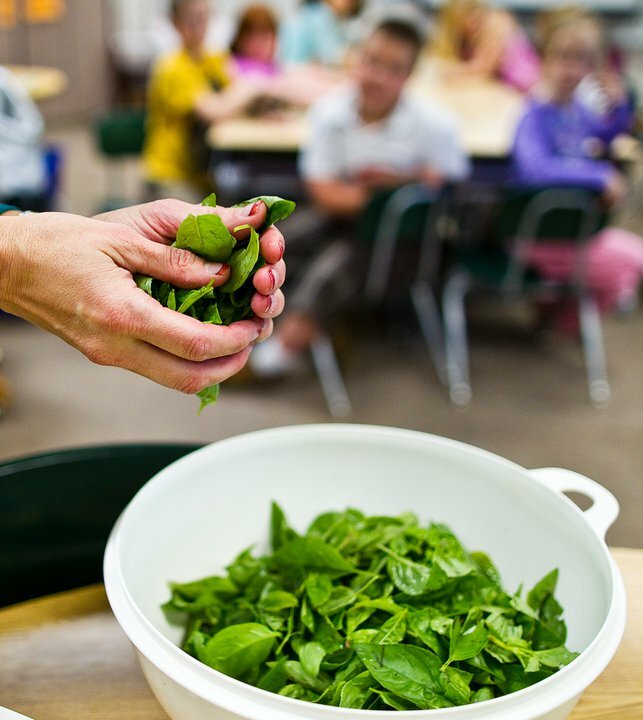 It’s especially exciting when you see a garden working its way into so many different parts of the curriculum, and into the cafeteria too,” says parent volunteer Kat Hansen. NOVA middle school uses their garden, now in its second year, to supplement the classroom work. “Currently we use the garden to teach science so our students better understand concepts such as cycles in earth systems by observing the changes in the garden over the course of a year,” says Nicole Caden, Advancement Director at NOVA. “Another value of the NOVA School garden is that it adds to the aesthetics in the neighborhood. 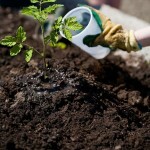 We have noticed an increase in foot traffic since the garden was installed,” adds Caden. The program is also developing the next generation of food bank volunteers. “A 6-year-old can grow carrots and bring the vegetables into the Food Bank,” reports Ray. NOVA middle school students harvested over 300 pounds of produce last year, all of which was donated directly to the Food Bank. “The overarching lesson of the NOVA School garden is respect for real food and community service. The garden is also teaching students about responsibility, teamwork, citizenship, environment sustainability and nature’s laws,” says Caden. Over 1,000 pounds of fresh produce was donated to the Food Bank last year from school gardens. While this represents a small percentage of the produce distributed at the Food Bank, it does add variety. “School gardens donate produce that we don’t see from other sources,” comments Ray. “Our produce such as purple beans and vine-ripened tomatoes were rare varieties and we were told were a valued treat for clients of the Food Bank,” says Caden. While many of the school gardens were in existence before the Food Bank started its program, the support has helped the plots continue to thrive, expand, and provide added support to schools. The Food Bank’s program support may take many levels including providing seeds and plant starts, organizing summer watering, coordinating work parties, networking on funding sources, and in some cases, financial support. Four elementary schools receive more intensive support due to the demographics of school. 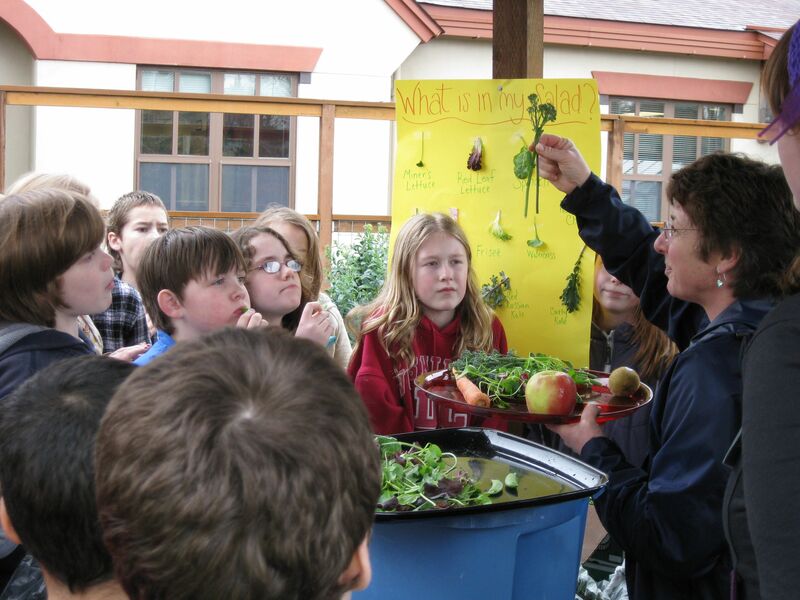 Over the past three years, Madison’s school garden has donated close to 500 pounds to the Thurston County Food Bank. While school is in session, the produce is shared with the students. With the help of Avanti High School students, Farmstand Fridays occur once a month at the school. Ray selects 5 or 6 fruits or vegetables. Children earn tokens that can be redeemed for a produce item. Using a mobile cooking cart, a volunteer prepares recipes with the kids using the produce available at the Farm Stand. “Kids are expanding their palate. They used to prefer apples and carrots. Now they are more adventurous and pick more unusual fruits and vegetables, such as kale, broccoli and local organic baby greens,” comments Ray. 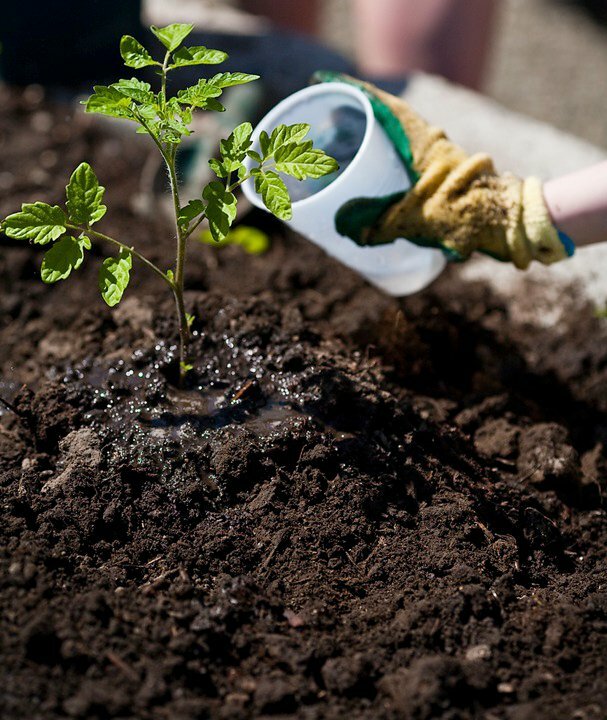 Here are some examples of special projects at other school gardens. 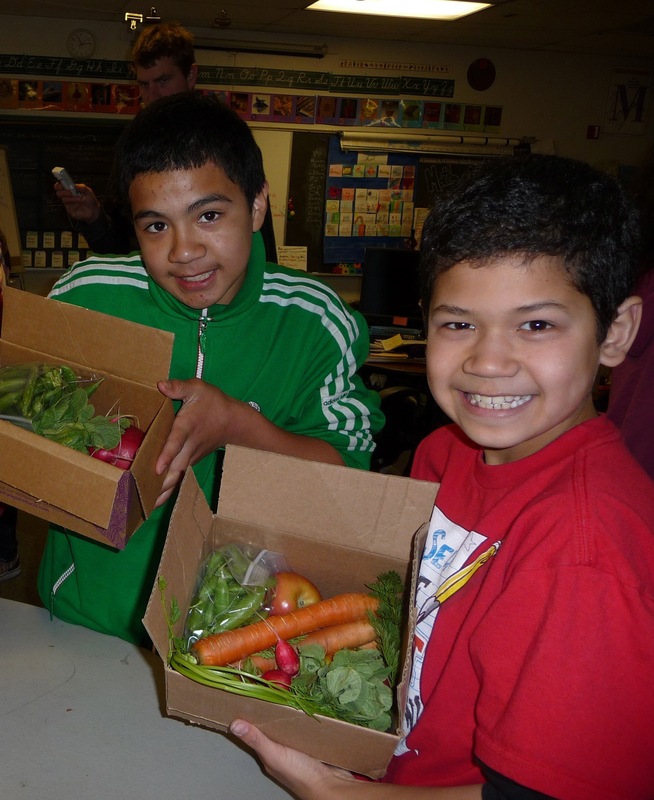 Kids pack mini-CSA’s for students at Garfield Elementary. Produce is delivered to the school and supplements the FORKids weekend food program. In the Spring, volunteers from Slow Food Greater Olympia joined students from Meadows Elementary in the garden. Kids receive a copy of Chop Chop, a children’s cooking magazine, to supplement their learning and provide recipes for cooking at home. 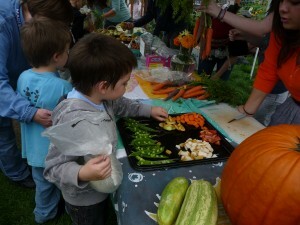 Children are encouraged to nibble and eat from the gardens, even if the produce is intended for the Food Bank. “Children need to have the experience of picking a fresh strawberry or snapping off a pea directly from the garden,” summarizes Ray. To learn more about the program, contact Karen Ray at schoolgardens@thurstoncountyfoodbank.org.